CAIRO – 19 April 2018: In celebration of World Heritage Day on April 18, Egypt's Ministry of Environment in cooperation with the German Embassy in Cairo held a talk titled "Climate and Heritage: Unlocking the Past, Sustaining the Future" to provide more insight into climate change and its protracted impact on archaeological sites. The talk, which brought together experts from the government and public sector, representatives of NGOs and various research institutes, aims to highlight the threats that climate change pose on heritage and discuss the different mitigation and adoption measures needed to protect heritage sites as well as intervention methods. 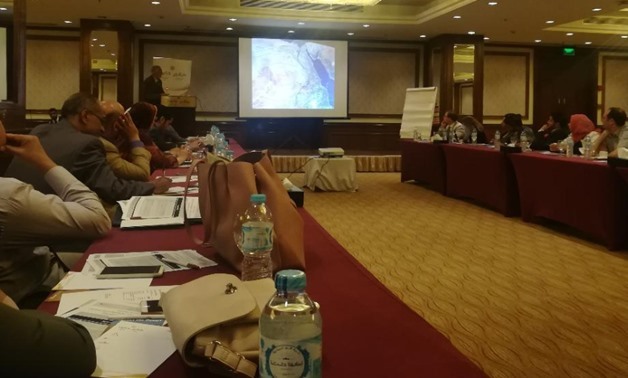 The noticeable deterioration of El Nadura temple in El-Kharga Oasis, in the New Valley Governorate, was discussed in the talk as a vivid example of how climate change and unsustainable practices are endangering Egypt's heritage. Above 45 percent of the original temple has deteriorated, and this has mainly occurred due to climate change including high temperature, low precipitation levels, and high winds. "If the rate of deterioration continues; the major landmarks, symbols and inscriptions will fully disappear by 2150," Hossam Ismael, associate professor of applied climatology in Assiut University, said during the talk. "The ordinary citizen has a role in protecting the environment and eliminating air population which is one of the main factors of climate change. Thus, it's important to diffuse knowledge and awareness over climate change and its effect on heritage. Heritage belongs to the Egyptian people and it should be protected by them," Tatiana Villegas, culture program specialist at UNESCO's Regional Bureau for Sciences in the Arab states, told Egypt Today. Villegas stressed the importance of the media's role in raising the awareness on climate change. "There should be climate change journalists who are specialized and fully aware of all the reports and updates related to this issue. The media has a crucial role to play in promoting and transferring knowledge about climate change." In 2016, UNESCO and the Union of Concerned Scientists published a report stating that heritage sites all over the world were already threatened and that more threats were yet to come. Rising sea levels also form a serious and rapid growing threat to ancient monuments near bodies of water. In the recent floods in the city of Alexandria, many Roman-style buildings were hit by the flood and were damaged beyond repair. Furthermore, air pollution has caused the deterioration and erosion of many archaeological sites. Addressing the 52nd Cairo Climate Talks, the German archaeologist and Chairman of Heinrich Barth Institute, Rudolph Kuper, offered a speech titled "Climate, History and Heritage of Egypt's Western Desert" in which he touched on the effect of climate change on sites in Egypt's Western Desert. He recommended raising awareness on invisible archaeology, creating infrastructure for preventive archaeology, limiting bureaucracy and routine archaeology as mitigation measures to protect heritage sites. The talk came up with a set of recommendations that includes reducing unsustainable practices as well as immediate intervention in order to maintain heritage, its culture, knowledge and its economic return. World Heritage Day, launched in 1983, aims to raise awareness not only on the diversity of the planet's cultural and natural heritage, but also its fragility. It also spots the ways in which we can conserve and safeguard this heritage while highlighting preservation initiatives worldwide.